Great American Taxi On Mountain Stage Vince Herman makes his homecoming at West Virginia University, performing an energetic four-song set of straight-ahead country rock. Great American Taxi performed on Mountain Stage. Great American Taxi's Mountain Stage performance was recorded live at West Virginia University's Creative Arts Center in Morgantown. Taxi member Vince Herman, who first appeared on Mountain Stage in 1999 with Leftover Salmon, was enrolled as a student at WVU in the '80s, and the excitement he felt from returning to his old stomping grounds can be heard in his voice throughout the four-song set. Dubbing its music "Americana Without Borders," Great American Taxi has become a summer festival mainstay. 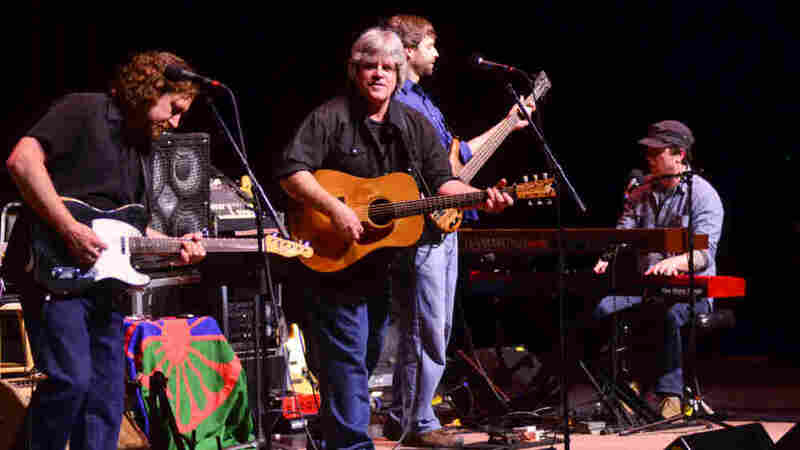 The band got together in March 2005, when Leftover Salmon's Vince Herman joined keyboardist and singer Chad Staehly at a benefit concert in Boulder, Colo. While the group has developed a loyal following among the jam band scene, Taxi eschews the genre's noodle-y trappings in favor of straightahead country rock, in the spirit of The Flying Burrito Brothers, Little Feat and Uncle Tupelo. For its most recent release, Reckless Habits, the band enlisted Railroad Earth's Tim Carbone as producer.